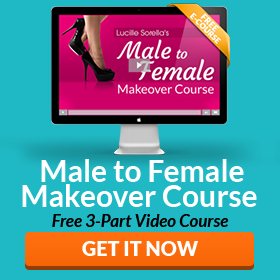 If you’re reading this right now, then I’m guessing you work very hard at perfecting your feminine image. There’s a lot to think about, isn’t there? And that’s not even counting serious life changes like hormones or surgery. The problem is that when you focus on everything that still needs improving, it’s easy to forget how far you’ve come already. Well, today I want you to put all that improvement stuff on hold. Forget about what you still need to do and celebrate what you’ve already achieved. Seriously, girlfriend – you are AWESOME! What has been your greatest achievement on your feminine journey so far? Or it could be a smaller victory like buying your first lipstick or choosing your feminine name. So let’s hear it! 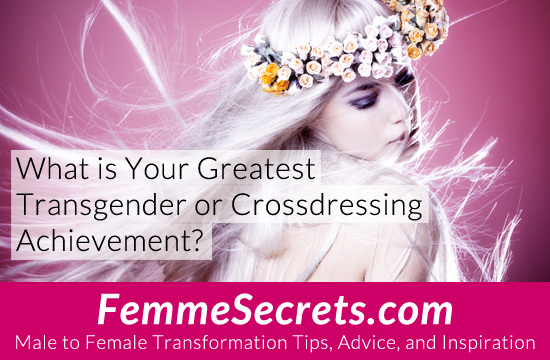 What is your greatest transgender or crossdressing achievement? P.S. If you are looking for more ways to validate your femme self, my FREE Unleash Your Inner Woman hypnosis mini session is a great place to start. When I first made up dressed and went out wow. Then when my first real Man brought me a drink and hit on me again wow. Then when my first real Man took me home and used me wow!! I now have the confidence to go out in public as Tina. I go shopping, to restaurants, and to the movies as a woman. Of course, when I’m out as a woman, I use the women’s bathroom. I have even had gg’s talk to me as just another girl there. It’s so wonderful to be out in public as my inner girl.